Aaron Wheeler and Aplhonsus Ng In the true collaborative spirit of the Donnelly Centre, Alphonsus Ng brought his skills as an engineer to solve some of biology's difficult questions. He was awarded the highest student accolade - the 2014 Donnelly Thesis Prize - for his work on developing microfluidics-based technologies for use in clinical diagnostics and biological research. This work was supervised by Dr. Aaron Wheeler, a professor at the Donnelly Centre and Department of Chemistry. The award committee, chaired by Professor Christopher Yip, also of the Donnelly Centre, announced their decision on May 27, 2015. “The Donnelly Thesis Prize Committee was impressed with not only the exceptional interdisciplinary and collaborative nature of Alphonsus’ work, but also its clear translational potential,” says Yip. The goal of Ng’s research was to miniaturize laboratory processes, such as clinical diagnostics, onto chips no bigger than a credit card. The reading of the chip, and data analysis, are done by another custom-built instrument. Such instruments are smaller and faster than the cumbersome robotic liquid handlers that are currently used for sample analyses in central facilities. a microfluidics chip with colored liquid split into droplets Microfluidics chips engineered in the Wheeler lab are special in that liquid is moved around as individual droplets rather than as a stream. This is made possible by tiny electrodes that form a checkerboard pattern on the chip. By applying voltage to these electrodes, electric fields can be generated that split liquid with biologically relevant materials into many separate droplets, which can be individually manipulated. This allows experiments to be done in batches where each droplet corresponds to a single test tube in a standard laboratory experiment. 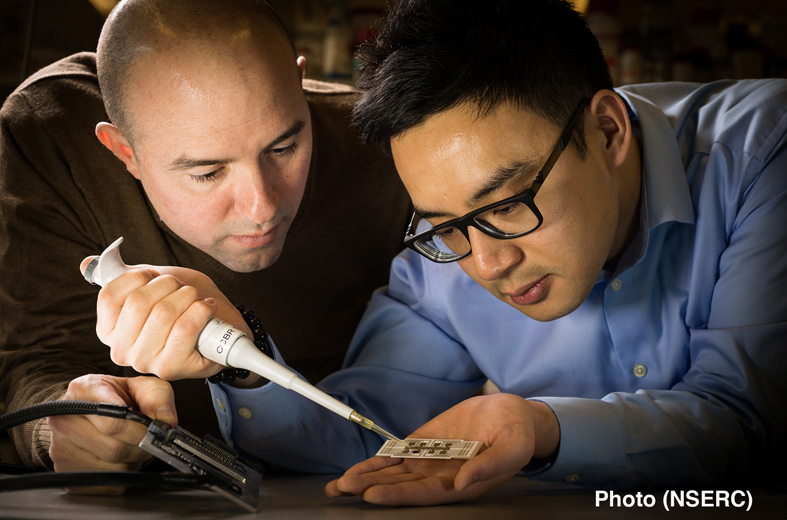 During his doctorate, Ng developed two distinct applications for the microfluidic device, to be used for clinical diagnostics and biological research. Last year, Ng and his colleagues won a Grand Challenges Canada grant of $112,000 to test how well their device detects rubella and measles in a population in Vietnam, where infection rates are high. The researchers will use the grant to prepare the device and instrument for use in the field. “I want to make it smaller, lighter and cheaper,” says Ng, who hopes to apply his technology in the field later next year. Another application of Ng’s research will help scientists get a better grasp of dynamic signaling events in a cell, such as protein phosphorylation, which play out rapidly and are often missed by traditional, slower methods. 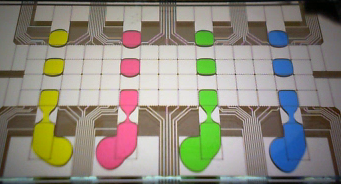 Using microfluidics chips, Ng, along with Dr. Dean Chamberlain, a former postdoc (now research associate) in Professor Michael Sefton’s group at the Donnelly Centre, have been able to observe these events closer to real time. Their work will be published later this month. "The environment is really amazing. There are three other groups on my floor and I talk to them very often and come up with joint projects. I don’t think that would have been possible if it was not for the shared environment.” Dr. Alphonsus Ng. Ng’s love of engineering started when he was in high-school. “I was playing a lot of video games back then,” says Ng. This led to an interest in graphics card design and an undergraduate degree in engineering science at the University of Toronto. In his final year, Ng “tested the waters” in the Wheeler lab and never looked back. “The Donnelly Centre is truly like a home to me,” says Ng, who collaborates extensively with other labs in the building. “The environment is really amazing. There are three other groups on my floor and I talk to them very often and come up with joint projects. I don’t think that would have been possible if it was not for the shared environment,” says Ng. Wheeler said he had never met a student like Ng. “Alphonsus brings an almost unbelievable combination of intellect, hard work, persistence, kindness, and a nose for what is ‘important’ to his work as a scientist. I am grateful for the opportunity to have worked with him over these past few years,” says Wheeler, who is also a professor in the Department of Chemistry and the Institute of Biomaterials and Biomedical Engineering. Ng’s future plans include a postdoctoral position in the west coast of U.S., where he wants to continue to engineer small and powerful biomedical instruments. “Eventually I hope to be a prof one day. I want to develop some really cool technology in the U.S. and bring it back to Canada,” says Ng. Would he like to come back to the Donnelly Centre? “I’ll try my best,” Ng says with a broad smile. Donnelly Thesis Prize was established in 2006 and its previous recipients have gone on to take postdoctoral and faculty positions in world-leading research institutions, including Harvard, MIT and Princeton.